To apply for a library card, visit our front desk with a photo ID (such as a driver’s license or non-driver state ID) that shows your Blauvelt address. If you are newly moved to Blauvelt, you will need to bring proof of address in the form of a utility bill or signed lease. A library card is issued while you wait and may be used immediately. You will receive both wallet and keychain cards. Children may obtain their first card the summer before upon entering Kindergarten and any time thereafter. Non-residents may purchase a family library card for a fee of $370 (approximate to what the average Blauvelt resident pays in library tax). A non-resident card entitles any family member to full library privileges. Blauvelt business owners may obtain a courtesy card free of charge with documentation showing the names of both owner and business with a Blauvelt address. Dominican College students may obtain a free temporary card during the school year with a $20 deposit. Deposit will be refunded when card is returned. Students are financially responsible for any unreturned or lost items. Fines act as an incentive to ensure that popular materials are returned in a timely manner so that others may enjoy them. Fine monies help pay to replace lost items and purchase new ones. 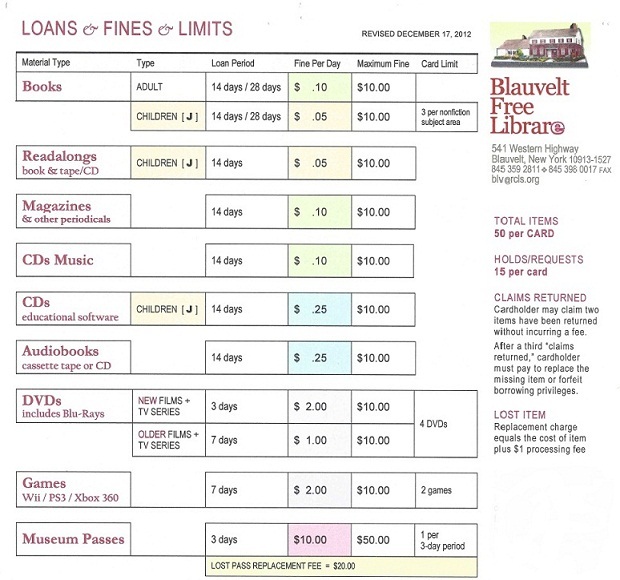 The system automatically blocks anyone from using their card at any library when fines exceed $10.00. You may pay down any or part of the fine to bring the total under $10.00 and regain use of your card. While we hope that you do not accrue excessive fines, our circulation staff will work with you to reduce large fines.